Here you can purchase ASM books, past copies of our journal, and Miscellaneous Papers. You can pay through a PayPal account or by using your credit card in PayPal's on-line shopping cart system. PayPal is a simple and secure method of on-line commerce. Please allow 7-14 days for shipping. Click on one of the categories shown below to begin shopping. T. Mayr: Richard Edwin Stearns; August 23, 1902 - July 12, 1969. J. Witthoft: Pitted Stones and Cup-Shaped Markings. P. Cresthull: Bifurcate Base & Other Early Archaic Points of Northern Maryland. H.J. Hacker: An Artifact File Envelope for Temporary or Permanent Use. W.M. Gardner & C.W. McNett: The Elkridge Site, Anne Arundel County. W.E. Clark: The Elkridge Site, Anne Arundel County. S.O. Geasey: Tuscarora Rock-Shelter, Frederick County. P. Cresthull: Styles of Oxshoes. V.R. Brook: The Role of the Amatuer Archaeologist. E. Gibbs: Drilled Steatite Disc from Baltimore Co.
S.O. Geasey: Stevens Rock-Shelter, Frederick County. J.D. Feagins: How Can Amatuer Archaeologists Help to Preserve Our Past. P. Cresthull: Chance: A Major Early Archaic Site, Sommerset Co.
C.W. McNett Jr.: Potomac Avenue Site, Washington D.C.
P. Cresthull: Chance: A Major Archaic Site, Pt. 2. W.E. Clark: Controlled Surface Investigations of an Archaic Period Hunting Camp. P. Cresthull: Bottle Rim Types Found in Maryland. C.L. Wise: Early to Middle Woodland Ceramic Sequence for the Delmarva Peninsula. D.W. Peck: Discriminant Functions for Maryland Projectile Point Types. S.O. Geasey: The Log Cabin Rock-Shelter, (18FR27). P. Cresthull: A Sample of Early Archaic Notched Points. P. Cresthull: The Human Figure in Indian Art in the Middle Atlantic Region. R. Looker: An Unusual Stone Pipe from Maryland. D.R. Woodward: Mayaone Ware Pot from P.G. County, MD. E. Gibbs: Exploratory Excavations, Inner Harbor Urban Renewal Area, Baltimore, Maryland. R.E. McDaniel: Analysis of Zekiah Swamp Projectile Point Variety. R. Korman: An Accokeek Vessel from Galloway Creek Site, Anne Arundel County. R.E. Artusy, Jr: The Proposed Ceramic Sequence in Southern Delaware. S.G. Pearl: 1976 Excavations at Belair Mansion, P.G. County. P. Cresthull: C-14 Dates for Early Archaic Point Traditions and Types. W. Barse, W. Clark & G Braley: The Purcell Site, Anne Arundel County. J.F. Custer: Comments on Peck's "Discriminant Functions for Projectile Points". D.W. Peck: Aboriginal Ceramics at the Obrecht Site, Anne Arundel County. D.W. Peck & T. Bastian: Test Excavations at the Devilbiss Site, Frederick County. L. Gilsen: The Environmental Impact Statement as a Research Source. G.C. Wilcox, Jr: The Use of Masks Among the Indians of Eastern North America. P. Cresthull: Wooden Iroquois Masks. P. Cresthull: Weeping-Eye and Mask Shell Gorgets. D.W. Peck: Artifacts from Submerged Areas of the Chesapeake Bay Coastline. L. Gilsen: Population Adaptation to the Chesapeake Bay; Estuarine Efficiency. D.W. Peck: Test Excavations at Waveland Farm, Anne Arundel County. P. Cresthull: Projectile Point Chronology in Maryland: Late Archaic - Woodland. L. Gilsen: Environmental Ecology of Calvert County: Environment and Subsistence. G.A. Hurley: A Tribute to Turkey Tayac. D.W. Peck: Test Excavations at Noland's Ferry Site, Frederick County. F.W. Porter: An Unusual Nanticoke Interview. P. Cresthull: A Trumpet Pipe from Southern Maryland. J.F. Custer and G. Gallaso: Lithic Resources of the Delmarva Peninsula. L. Gilsen: Environmental Ecology of Calvert County, Maryland:Archeology. R.M. Stewart: Prehistoric Burial Mounds in the Great Valley of Maryland. P. Rule and J. Evans: Investigations at the Marley Creek Site, Anne Arundel County. D.G. Shomette: Underwater Survey of a 19th Century Warship in the Patuxent River. S.A Burnston: The Cemetary at Catoctin Furnace, Frederick County. T.E. Davidson: Historically Attested Indian Villages of the Lower Delmarva. R.A. Thomas: Intensive Excavations at Hollingsworth Farm Site, Cecil Co.
G. Smith, T. Boyce, and M. Stewart: Two Stone Pipes from Martin's Meadow, Washington Co.
J.M. McNamara: Excavations at Baldwin: A Late Archaic Site in the Coastal Plain. P. Cresthull: A George Webb Pipe From Chard. J.L. Angel and J.O. Kelley: The Workers of Catoctin Furnace. R.D. Wall: The 1981 Survey of the Western Maryland Plateau Region. C.P. Falk: Cordage Impressed on Potomac Creek Pottery. J.F. Custer, J.M. McNamara and H.H. Ward: Woodland Ceramic Sequence of the Upper Delmarva Peninsula and Southeastern Pennsylvania. D.C. Curry: Book Review: "Maryland Indians", by F.W. Porter. H.A. McCord: Carl Manson (1913-1983). F. Painter: A Search for the Origins of the Clovis and Hardaway Traditions. J.F. Custer and K.R. Doms: Analysis of Surface Collections from the Oxford Site, Talbot County. K.W. Wesler: A Controlled Surface Collection at Lower Marlboro (18CV155). D. Koski-Karell: Comments on the Cut Spanish Coin from Colonial Joppa. H.A. McCord: Evidence for a Late Woodland Migration from Peidmont to Tidewater Peidmont in the Potomac Valley. P. Rule and J. Evans: Early Colonial Archeology at the Pyles Site, Anne Arundel County. W. Dubose and A. Hegamyer: The Zig-Zag Rock-Shelter (18FR587). S. Israel: Archeological Investigations of the Bradley Site (18CV219), Mears Creek, Calvert County. P. Cresthull: Some Human Heads in Indian Art. J.M. Mcnamara: Conowingo: A Late Archaic through Woodland manifestation in the Lower Susquehanna River Valley. R. Wall and S.Israel: Archeological Investigation of the Miller (18WC68), Nanticoke River, Wicomico County. P. Cresthull: A Reconsideration of Vertical Distribution of Small Debitage at the Baldwin Site(18AN55). J. Custer, P. Jehle, H. Ward, S. Watson and C. Mensack: Archeological Investigations at the Arrowhead Farm Site Complex, Kent County. P. Cresthull: Crotal Bells (Data Sheet Number 243). D.J. Pogue: Seventeenth-Century Proprietary Rule and Rebellion: Archeology at Charles Calvert's Mattapany-Sewall. C.W. Koontz: Preliminary Analysis of Artifacts from the Wallace Site (18HO91). H.L. Boyce-Ballweber: Geophysical Applications in Archeology and Their Use in Maryland. W.J. Hranicky: The C. Merry Cache of Bifaces in Montgomery County. P. Cresthull: Bifurcate Base Points, Part 1, Some Lecroy Varieties (Data Sheet 218). R. Wall, S. Israel and E. Otter: Potts 1 Lower Site: A Late Woodland Component on the Lower Wicomico Creek, Wicomico County. D. Lowery: A Birdstone from Talbot County. R.M. Stewart: Middle Archaic Period in the Great Valley of Maryland. W.P Barse: Additional Sites with Riggins Ware Pottery in Maryland. R. Wall, S. Israel and E. Otter: Reprints of Photographs from Vol. 24, No 2, Sept 1988 (Potts 1 Lower Site). T. Bastian: St. Marys City--Corporate Artifact. C.R. Bennett: Interpretive Study of the Use of Land and Space on Lot 83, Annapolis, Md. D.J. Pogue: Social Change and 18th Century Tidewater Maryland: Reflections in the Archeological Record of Annapolis. R. Brown: The Georgian Order in Annapolis. S. Israel and R. Whitlock: Mount Clare: Introducing Baltimore to 18th Century Splendor. W. Stone: St. Marys City--Corporate Artifact. A.E. Yentsch: Interpretive Study of the Use of Land and Space on Lot 83, Annapolis, Md. R.J. Dent: Social Change and 18th Century Tidewater Maryland: Reflections in the Archeological Record of Annapolis. M.P Leone and P. Shackel: The Georgian Order in Annapolis. E.A. Comer and K. Stevens: Mount Clare: Introducing Baltimore to 18th Century Splendor. R.A. Elder, Jr: Excavation Report on the Angelica (Knoll) Area: A Colonial Historical Site on the Jones Farm in Calvert County. G.M. Reynolds: In Memoriam: Paul Cresthull (1925-1989). H.L. Ballweber: The Burral Site (18FR628): A Rhyolite Processing Center in Frederick County. D.C. Curry: 25-Year Index to MD Archeology, Vols 1-25. W.J. Hranicky: Macpherson Side-Notched points. R.D. Wall and D.C. Curry: Test Excavations at the Barton Comles Site, Allegany County. R.D. Wall: Notes on an Early Woodland Feature from the Barton Complex (18AG8) Allegany Co.
M.L. Preston Jr: A Preliminary Report on the Historical Archeology of the Patapsco Female Inst. (18HO143) Ellicot City. D.C. Curry and D&B Ward: Rhyolite Cache Blades. R.D. Wall: Archeological Investigations at the Millersville Site (18AN803) Anne Arundel County. D.C. Curry and M. Kavanaugh: A New Radiocarbon Date for Popes Creek Ware. S.O. Geasey: A Comparative Analysis of Flaked Lithic and Ceramic Assemblages from Three Rock Shelters on Frederick County. J.G. Gibb: English Trade Tokens from a 17th Century Colonial Site in Southern Maryland. R.D. Wall: Archeology Under the Lake: Test Excavations at 18GA301 on the Youghiogheny Reservoir. H.L. Ballwebber: Return to the Luce Creek Site (18AN143). E.A. Moore: Bone and Antler Tools and Decorative Objects from the Rosenstock Site (18FR18). D.C. Curry and M. Kavanaugh: Update on the Radiocarbon Date from the Chapel Point Site (18CH79). W.R. Lynch and A&L Davidson: Cast Iron Bar (Pig Iron Ballast). L.E. Ackerson: Rediscovering the Sand Tunnels of Federal Hill, Baltimore. A. Luckenbach: Excavation of an 18th Century Dutch Yellow Brick Firebox and Chimney Stack, Anne Arundel County. A. Luckenbach and J.G.Gibb: Dated Window Leads from Colonial Sites in Anne Arundel County. D. Lowery and T. Phillips: The Meekins Neck Paleoindian Site Complex, Dorchester Co., Md. : A Paleoindian Settlement Model for Delmarva. B.F. Thompson: Wrought Iron Anchor. D.L. Lowery: The Amy's Marsh Broadspear Cache and Its Implications for Barker's Landing Complex on the Eastern Shore. J.R. Beal, S. Street, and G. Whidden: Archeological Study of the George Willard House: A Federal Farm House in Southern Frederick County. J.F. Custer: A Summary of Archeological Investigations at the White Swan Tavern (18KE232), Chestertown, Kent County. A. Luckenbach, E. Read, and D. Ware: Excavation of Jeffe's Inheritance: Chalky Site (18AN711). D.L. Lowery: Early 17th Century Site in the Upper Chesapeake: Analysis of Five Archeological Sites in Queen Anne's and Talbot County. S. Israel: Prehistoric Turtle Effigy on Full Grooved Axe. P.R. Mullins: Archeology of Race and Consumption: African-American Bottled Goods Consumption in Annapolis, MD (1850-1930). B.J. Little: Chronological Overview for Middle Atlantic Archeology and Some Thoughts on Issues. K.R. Doms: A New and Easier Method of Examining Oyster Hinges. S. Israel: Prehistoric Fish Art/Effigy on Stone Pendant or Fish Weight. J.F. Custer: Archeological Investigations at the Bloom Point Farmhouse (18CH216 Charles Co.
B.J. Little: An Overview of Economic Archeology inthe Middle Atlantic, Part I: Subsistence. R.M. Stewart: Early Archeological Reasearch in the Great Valley of Maryland. J.F. Custer, K.R. Doms, K. Walker and A. Allegretti: Archeological Investigations at 18KE1238, Kent County. J.G. Gibb and A.H. Hines: Selby Bay Susistence Strategies at the Smithsonian Pier Site, Anne Arundel County. L.E. Akerson and J. Bisacquino: Fragments of City Life: A Brief History of Archeological research in Baltimore, Maryland, 1914-1996. S. Israel: Archeological Investigations at the Clipper Mill Road Rockshelter (18BA32), Baltimore County. J. Moser: A Cannonball and a Post. J.B. Thomas and A.D. Lindauer: Seeking Herrington: Settlement in a Very Early Md. Town. C. Jane Cox: The Elmondo Site (18AN1058), London Town, Maryland. R. Newbury and G. Evans: Rhyolite Celt Fragment. D. Guzy: Fish Weirs in the Upper Potomac River. M.D. Cochran: Hoodoo's Fire: Interpreting Nineteenth Century African American Material Culture at the Brice House, Annapolis, Maryland. D.C. Curry: A Pre-State Archeologist Glimpse of Tyler Bastian. L.D. Jones: Crystals and Conjuring in an Annapolis Household. S.O. Geasey and H.L. Ballweber: A Study of Two Prehistoric Sites Associated with the Highland Metarhyolite Quarry, Frederick County. R. Callage, J. Kille and A. Luckenbach: An Analysis of 17th Century Clay Tobacco Pipes from the Chaney's Hills Site (18AN1084). C.J. Cox, D. Kavadias and A. Luckenbach: Skipworth's Addition (1664-1682): Limited Testing at a 17th Century Quaker Homelot, Anne Arundel County. L. Plumley and A. Luckenbach: Tracing Larrimore Point Through Time: Excavations at 18AN1065. M. Temkin: Guns or Plowshares: Significance and a Civil War Agricultural Landscape. L.J. Galke: Inferring Prehistoric Settlement Patterns using Phase 1 Archeological Data from the Naval Air Station, Patuxent River. C.N. Matthews: An Artifact of Race? D.P. Howe: Investigation of U.S. Navy PBM-3 Bureau of Aeronautics Number 6672, Choptank River. M. Kavanaugh: Late Woodland Settlement in the Monacacy River Region. R.D. Wall: Preliminary Archeological Investigation of the Maddox Island #2 Site (18SO240), Somerset. B.W. Slaughter: Old Bones Beneath the Earth Do Lie: Archeological Excavation at the Facility Cemetary (18CR239), Near Sykesville. S. Israel: Archeological Excavations at the Losch Rockshelter (18BA458), Baltimore County. D.F. Thompson: The Swan Cove Wreck (18ST643) St Mary's County. D. Guzy: Fish Weirs in the Monocacy and Potomac Rivers. J. Beasley, T. Gwaltney and M. Temkin: Gaining New Perspectives on the past: An Application of GIS at the Best Farm. Charles Walker Dawson memorial (March 14, 1932 - January 14, 1980). D. Kollman and R. Wall: A Little Bite of Prehistory. J. Kille and J. Moser: An Elusive Discovery: The 17th Century Town of Herrington. M. Kerns-Nocerito: Geophysical Survey in the All Hallows Graveyard, Anne Arundel County. D. Gadsby: Industrial Re-use of Domestic Ceramics at Swan Cove (18AN934). B. Thompson: Bungay Creek Wreck (18KE339), Kent County. S. Geasey: The Highland Metarhyolite Outcrop: Ten Years Later. R. Dent, K. Clermont, A. Ghobadi and K. Woodman: Excavations at the Winslow Site (18MO9): Preliminary Report on the 2002 Field Session. D. Curry: The Old Copper Culture in Maryland? C.J. Cox and S. Sharpe: View From the Top of the Hill: The Early 18th Century Homesite of the Talbott Family. A. Luckenbach, C.J. Cox: 17th Century Lead Cloth Seals from Anne Arundel County, Maryland. J. Beasley: Current Archeological Research at Monacacy National Battlefield. J. Beasley: The Occupational History of Best Farm: Research and Excavation Results. J. Beasley and T. Gwaltney: Applications of GIS to Archeological Projects: Examples from the Best Farm. B. Bies and M. Gallagher: The Use of Systematic Metal Detector Surveys as a Site Identification Method in Historic Landscapes. D. Curry and M. Kavanaugh: Excavations at the Rosenstock Village Site (18FR18), Frederick County, Maryland: A Preliminary Report. Al Luckenbach & David Gadsby: Native American Stone Celts from Colonial Contexts in the 17th Century Settlement of Providence, Maryland. Al Luckenbach: Fowl Play at London Town? Lisa E. Plumley & Erin N. Cullen: A London Town Burial: A Study in Past and Present Customs. Lauren Frarnz & Al Luckenbach: The Building Sequence at Homewood's Lot, Anne Arundel County, Maryland. Joy Beasley: Pewter Canteen Spout Inscribed "LT. HART. 128"
Bruce F. Thompson: Pig Iron. Richard J. Dent: The Winslow Site: Household and Community Archeology in the Middle Potomac Valley. Elizabeth A. Moore: Faunal Remains from the 2002-2003 Excavations at the Winslow Site (18MO9). Dana D Kollmann & Douglas W. Owsley: Winslow Site Burial Examination. Kathryn Steuer: Winslows Past-The Last four Centuries of Land Ownership. Point Lookout State Park, Maryland (18ST728 & 18ST729). Thomas E Davidson: The Last Town Standing - The Choptank Indian Town. James G. Gibb: Mean Ceramic Dates for Hagerstown Valley Pottery. James G. Gibb: Cellaring Wine at Melwood Park (18PR225), Prince George's County, Maryland. Stephen S. Israel: Brass Astronomical Ring Dial (Sundial). James G. Gibb: Garret's Choice #3 (18PR704): A Hilltop Paleoindian Site in Southern Prince George's County. James G. Gibb: Dove's Nest Afire! An Early Colonial House in Aquasco, Prince George's County, Maryland. Al Luckenbach & Lauren Schiszik: The Raven Site (18HO252): An Early 18th Century Plantation in Howard County. Jason D. Moser: Commercial Brickmaking: Archeological Investigations of Governor Horatio Sharpe's Brickyard (18AN1103). James G. Gibb: Western Maryland Red Earthenware:Consumer Choice at the Early 19th Century Reiff Site (18WA454). Isotope Ratios in Late Woodland Page (A.D. 1025-1250) and Keyser (A.D. 1400-1550) Phase Faunal Remains in Maryland. Al Luckenbach & Shawn Sharpe: A Seriation Analysis of "Trade" and "Belly Bowl" Tobacco Pipe Forms from ca. 1655 to ca. 1725. Robert A. Newbury: What About the Biggs Ford Bow? Richard J. Dent: Claggett Retreat: Formative Settled Life in the Middle Potomac Valley. Justine W. McKnight: Analysis of Flotation-recovered Archeobotanical Remains from the Claggett Retreat Site (18FR25), Frederick County, Maryland. Elizabeth A. Moore: Faunal Remains from the Claggett Retreat Site (18FR25). Sara Rivers Cofield: Why keep a Crooked Sixpence? Religion and Magic at a Jesuit Plantation in St. Inigoes, Maryland. Gregory M. Katz: An Unusual Find and Unusual Preservation at the Bellevue Housing Complex, Site 51SW7, Washington, D.C.
Carol L. Cowherd: Using Land Records to Look for Port Tobacco in the 18th Century. Al Luckenbach: Sourcing Two Adena Stone Tube Pipes from Pig Point (18AN50). Al Luckenbach: Two Dated Archaic Period Hearths from Pig Point(18AN50). Al Luckenbach, John E. Kille & Shawn Sharpe: The Architectural Remains of Samuel Chew's "Large and Elegant Mansion"
The product of nearly 30 years of research, The Montgomery Focus is an analysis of a series of Late Woodland habitation sites in the middle Potomac drainage. Four villages form the core of this study, and each is reported in detail. Based on data from these four sites, Slattery and Woodward define the Montgomery Focus -- an Owasco-like cultural phenomenon marked archeologically by crushed quartz- and granite-tempered, collared Shepard ceramics, clay elbow tobacco pipes, bone artifacts, medium-sized triangular projectile points, oval village plans, flexed burials, and corn agriculture. This 184-page volume contains more than six dozen illustrations and two appendices, one of which describes more than 100 discoidals (or chunkey stones) from the Winslow site. 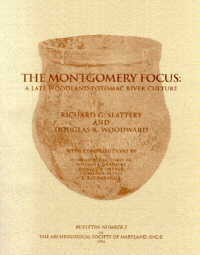 The Montgomery Focus is a must-have addition to the library of any student of late prehistoric archeology in the Middle Atlantic region. BENJAMIN BANNEKER, widely regarded as America's first African American man of science, resided for most of his life on a farm in Baltimore County, Maryland. Historical records provide scant glimpses of the home where this humble farmer and self-taught astronomer lived from 1737 to 1806. Susanna Mason of Pennsylvania, who visited Banneker in 1796, described his house as a “lowly dwelling built of logs, one story in height and surrounded by an orchard.”Banneker's house reportedly burned to the ground on the day of his funeral. The passage of time and forces of nature gradually erased any visible vestiges of the house and farm. The archeological discoveries reveal tangible evidence of Banneker's homestead and yield new insights into the life and times of this important figure. 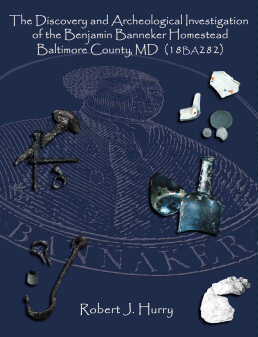 While the initial archeological testing has just begun to scratch the surface of this significant site, preserved within Baltimore County's Benjamin Banneker Historical Park and Museum, future research efforts will expand our knowledge and appreciation of Benjamin Banneker. ISBN 1-878399-77-2. 244 pages, 64 figures, 24 tables, references, appendices, index. $15.00 (softbound). 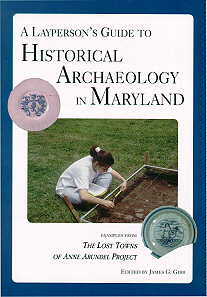 Written for the volunteer, A Layperson's Guide to Historical Archaeology in Maryland is a comprehensive introduction to the “hows”and “whys”of historical archeology using examples from The Lost Towns of Anne Arundel Project. This 80-page guide covers everything from developing a research design to report writing, finding sites to excavating them, and using common mason's trowels to surveying with the latest in advanced geophysical instruments. A Layperson's Guide will prepare both experienced and new volunteers for a more meaningful and rewarding experience during their next visit to an archeological excavation. OSSUARIES are communal graves containing the reburied, skeletonized remains of multiple individuals. For more than a century, archeologists have been intrigued by the Native American practice of ossuary burial in the Maryland tidewater region. During this time, investigations have run the gamut from antiquarian curiosity to modern scientific study, although details of much of this work are poorly reported or only found in obscure technical literature. For the first time, Feast of the Dead attempts to compile all of this information in one volume, and examine the data from Maryland's three dozen known ossuaries from an archeological perspective. In Feast of the Dead (a title derived from the 17th century Huron burial ceremony), Maryland Historical Trust archeologist Dennis C. Curry details the excavated data from each of Maryland's ossuaries, and takes a look at what these unique mortuary features may mean. Clearly reflective of Native American spiritual beliefs, ossuaries also appear to evince native social, political, and status concepts which evolved during the period from roughly A.D. 1400 to the time of European contact. A valuable research source for archeologists, Feast of the Dead is intended to shed light on Native American burial rituals for the general reader as well. It also serves to help reconstruct the lifeways and belief systems of late prehistoric Algonkian groups in Maryland. ISBN 878399-72-1. 120 pages, 61 illustrations (including 51 photographs), tables, references, glossary, index. $15.00 (softbound). V. Clyde: Shepard Barrack Site, Montgomery Co.